Edward the Confessor was born at Islip, England. He was the son of King Ethelred III. 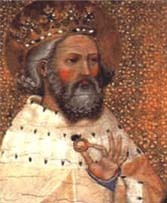 Edward was King of England from 1042-1066. He built St. Peter's Abbey at Westminster. Edward was known for his piety and compassion for the poor. He died in London on January 5, 1066. His body was later found to be incorrupt. He was canonized in 1161 by Pope Alexander III. We celebrate St. Edward's feast day on October 13.